Before the storm, I made hubs a new BBQ apron with an embroidery design from Urban Threads. I think it turned out great! Their designs always stitch out truly top-notch. And a friend of mine has the most amazing garden and she cans like nobody’s business all summer long. I couldn’t resist making this for her. We are leaving for the coast this coming Thursday for our 16th wedding anniversary weekend. We got married on July 3rd so we’d always have a 2-day holiday and there’d be free fireworks. Smart huh? 🙂 We won’t be back until Tuesday the 4th so I’ve already prepped a UFO, a WIP, and 2 new projects to keep me busy. The UFO (Unfinished Object). The very first quilt I ever made in 2010 is off the longarm. It’s a hot mess but it’s mine and I can’t wait to hang it over the deck at the coast to show off our patriotism. Hopefully, from a distance at the street, the tipped stars will be overlooked. ha ha I need to add a navy blue binding and it will be finished. Finally…7 years later. It was the first full quilt I ever put on my new longarm too so yes it has issues but I truly don’t care. On the whole, it’s beautiful with a few flaws I can live with. Goodbye Valentino has inspired me to give a try to some bucket hats from Oliver+S. The free pattern is here. Now that Cars 3 has been released, I thought I’d make up two for my grandsons and I found some long lost fat quarters in my stash for one for my granddaughter. And last but not least, the WIP (Work in Progress). I’ll put some time into the Dinosaur QAYG project from ShinyHappyWorld.com that I’m hoping to have ready for the grandboys for Christmas. I think that’s enough to keep me busy during the quiet hours this weekend (if there are any). What do you have in the works? Have a happy and safe 4th of July! Those who know me know that I make no bones about being thrifty in my pursuit of my hobbies. While I’ll spend money where quality is required, I’ll also DIY where I can to save a buck… or two…or twenty…or ten thousand as in the case of my longarm. Let’s take Machine Embroidery Target Stickers. Nice, but not necessary. Most professionals just chalk a 90 degree crisscross and call it good. But if you’re using a fabric that doesn’t take chalk well like a towel, or you don’t want to have to remove chalk lines like on a satin, or you can’t find said chalk, then a sticker works great. It stays put and provides a great pinpoint to see where you want to start. There are pre-printed stickers out there you can buy where you get 250 stickers for (sales pitchman voice here…) “An amazing low price of just $19.99!” ($24.99 on Amazon Prime) Or…you can buy 525 Avery removable dot stickers # 6736 and draw your own 90 degree angle on them, for just … wait for it… $10.58. More than twice the number of stickers for half the price. And here’s a cool little tidbit – it doesn’t matter where the crisscross is on the sticker just so long as the lines are at a 90 degree angle. Easy peasy. I just penciled in a page of them here. Dexter the Dragon’s baby sister Darla. Y’all remember my last post about the failure on the blue dragon from Shiny Happy World? I gave it another shot with fleece instead of Minky and success! Here she is! I bought some blue fleece for her big brother and will finish him this weekend. Don’t you love her rosy tummy? I did some extra stitching on those wings at the spine because if my granddaughter is anything like me (and she looks EXACTLY like me) then those wings will be swung like a boomerang prior to launch at her brother. This pretty girl is double stitched everywhere! Apron Embroidery. A co-worker, Diane, is really into competition BBQ cooking just like hubs and I are. She is hosting her daughter’s high school graduation BBQ this coming weekend and they are smoking 23 beef briskets to serve nearly 400 folks. One aspect of BBQ cooking is Showmanship. Her sister bought all of them matching aprons and she asked me if I’d embroidery hers with her nickname DeeDee. She told me how she wanted it and I let her proof 4 different fonts via text prior to stitching. I just love it and so did she. Another month has gone by and so goes another block of the month. This is a pattern by Nancy Rink and her quilt Getting to Know Hue. This is Getting to Know Red. 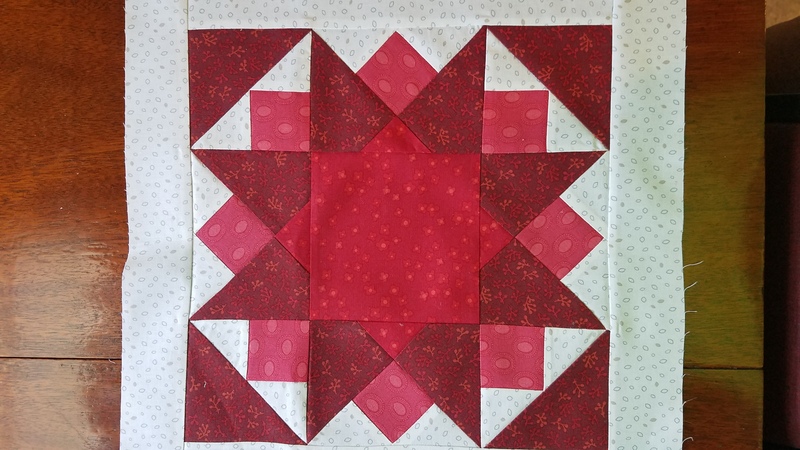 This month’s block really challenged my piecing skills. I learned new techniques to create blocks I’ve never done before. I absolutely love the intricacy of this quilt and all of its designs. Y’all, this is probably some of the best piecing I’ve ever done this month. Check out those points and joins. I have to say I’m very proud. 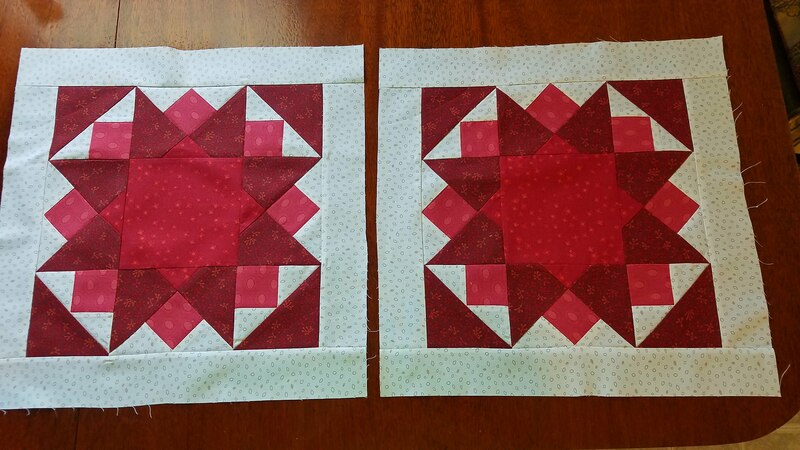 😊 It is a bit wobbly on the sides where I aimed for the center but I’m hoping that disappears in the quilting. A new technique I added to my piecing skills is this little trick with painters tape. 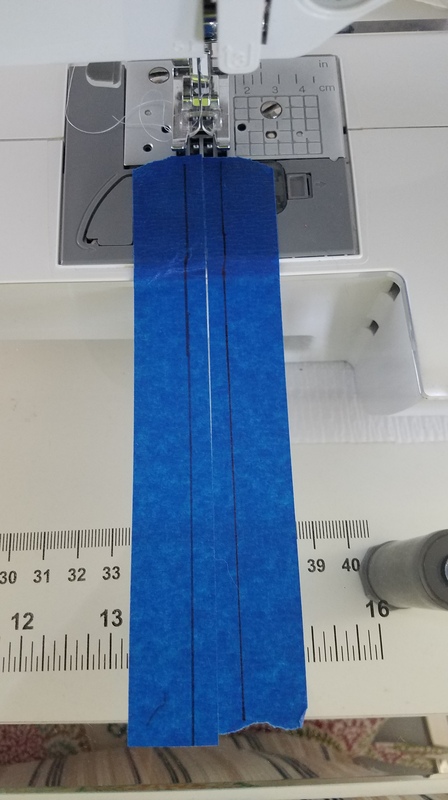 I drew one-quarter inch lines from needle center on the painters tape so no matter which side I stitched from, my stitch lines were accurate. It really helped to have the line a little longer then would seem necessary because it helped me to hold the fabric straight as it went through the feed dogs and I could eyeball the exact 1/4″ just before the needle. And using this presser foot was just the thing to hold the fabric exactly in place as it stitched. From now on, this will be the only way I piece my blocks. Obviously, the SewSteady table helps. Next month is Orange. Can’t wait for the fabric to get here! 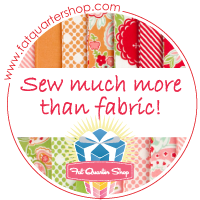 We all see the pictures of perfect stuff all over Facebook, Pintrest and IG of perfect sewing projects, perfect quilts, perfect lives, perfect this, perfect that, blah blah ad nauseum. And so many of my friends think that when I sit down at a machine, miraculously perfect things happen immediately. Well, I’m here to tell you that is not true. While I might consider last weekend completely wasted because my project was a COLLOSSAL FAIL, I actually learned a great deal. The trick is not to allow failures to deter you from your goal, no matter what the task at hand is. Try, try again. Right? I’m making this little guy. Isn’t he adorable? He was going to be for my grandson’s 6th birthday this week, and I’d diligently planned it all out. I bought the softest, most cuddly blue Minky fabric for the body and had some gray Cuddle Bubble on hand for the belly. Someone put a pic of the blue/gray version on FB and I just had to make it. I found some awesome silver scuba knit at Walmart for the wings, I ordered the safety eyes from Amazon, and was all ready to go… on time. Then I sat down at the sewing machine and every thing changed. First of all, I cut the pattern wrong. No biggie, I had plenty of fabric. That’s normal in my world so I wasn’t discouraged. Mind you, I’m covered in Minky shreds from hair to flipflops but that’s part of the adventure. I was prepared for that. Now the wings. The pattern says to cut two pieces of fabric and one piece of foam in the shape of the wing, and then to sew them together. Sounds easy enough but the result was a silver blob that no way resembled a wing. See top wing in first image below. Things shifted everywhere in the machine, pins/clips or no, and was a real beast. Needless to say, I’m glad my grandson wasn’t around because a sailor appeared somewhere in the room. On my 2nd attempt, I cut the foam and sewed it to two squares of fabric (2nd photo) and then cut out the wing around the foam. Success! See bottom wing in top picture. This method allows the best shaping possible. Also, if you do sharp points like this, there is a little garment sewing trick for collar points to take a small single horizontal stitch (or two) at the tip before beginning the next upward angle. This single stitch gives the fabric room enough to make a beautiful point without a bunched up rounded wad. The hands and feet were no trouble and sewed together just fine (after I figured out I had to hand-baste the bottom of the foot to the top) and I placed them in the same location on each side of the body pieces. I added the wings – no problem and he was coming along nicely! Now the tummy. You’d think the biggest piece would be the easiest. WRONG! Much like sewing a sleeve into an armscye (arm hole), the tummy must be positioned perfectly to make it all match up. There are points on the pattern for notches to match but I couldn’t see them in the Minky. So I gave it my best shot and sewed the tummy gusset to the body. The result was a lopsided, unbalanced, wonky kinda dragon thingy. My husband was a sweetie and said to finish him anyway because my grandson wouldn’t care, but oh no. That’s not how I roll. There’s perfection or close to it (which would be nice) and then there’s something that will embarrass me every time I lay eyes on it. After 10 hours of this project, I tucked it all into a drawer, got myself a cold beer, and ordered him a set of binoculars on Amazon. However, I’m not deterred. I’ve already picked up a half yard of blue fleece to give the next dragon a try. Cross your fingers! I’m Featured on the Moda Bake Shop!